No more old 500 & 1000 notes? Great news for digital wallets? Last night, Prime Minister Modi announced the demonetization of Rs. 500 & Rs. 1000 notes starting from 9/11 with the aim of curbing black money. In less than a couple of minutes social media was flooded with news links, jokes, memes, and criticism. While some became economists, others turned stand-up comics with their witty one-liner take on the news. That also include praising the clever ones who use digital wallets! And this tweet above showcases the future of digital wallets in India. Sure, we have a long way to go when it comes to having a basic infrastructure needed for such provisions in the rural parts of India. But as far as metros and urban areas are concerned, does this seem like a dawn for cashless payments and online wallets? 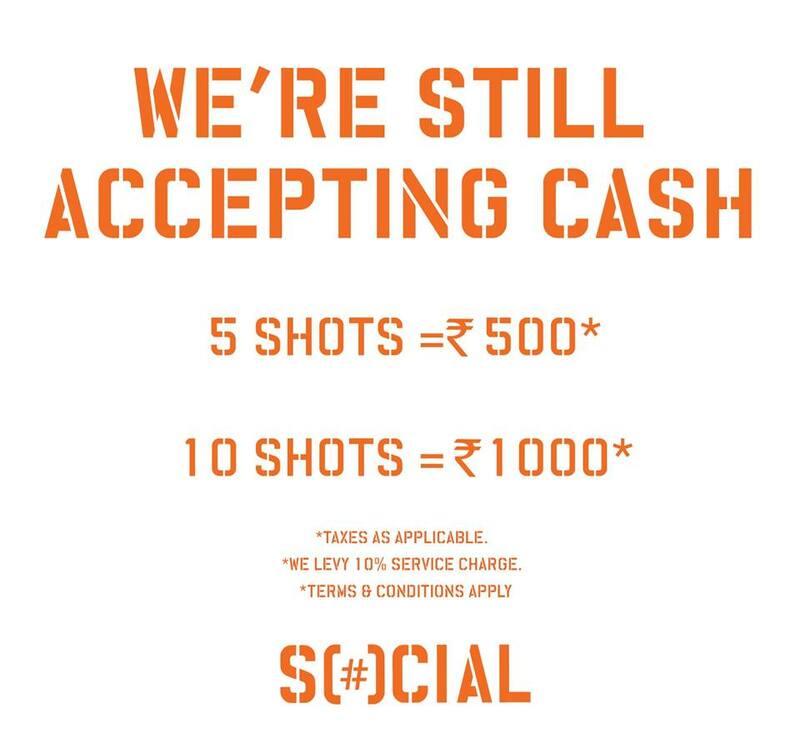 With this move, we don’t yet dare to say that cash is dead since the large part of Indian economy is still cash-centered. And yes, a new 500 notes will be issued and 2000 notes will be introduced but what’s going to get a new life are the digital payment methods. With this bold move, it’s said that now India is heading towards Digital revolution in a true sense. All the digital wallets and online payment companies are rejoicing because of this decision and so are the e-commerce sites. Sure, there would be some inconvenience for online shopping sites – especially for the already placed cash on delivery orders. But as speculated by those companies, cash on delivery will be soon outdated. 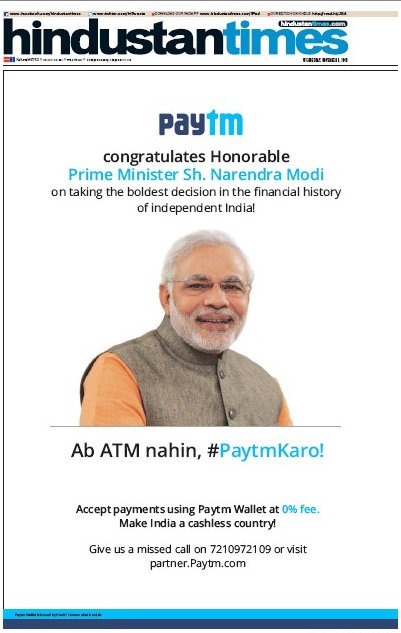 No wonder PayTm released this full front-page ad in Hindustan Times today congratulating the Prime Minister for his bold step! Bipin Preet Singh, CEO of MobiKwik called it the biggest surgical strike on cash. He believes that with a 50 day, a billion Indians will change their payments moving from cash only to a cash-free using the digital wallets. Sure, there will be short-term problems because of this decision, but soon, a lot of Indians will be joining the mainstream economy and this all will be done through online payment options and digital wallets. Digital wallets will soon be on everybody’s smartphone regardless of their age or location. Not just private digital wallets; GOI is on it too! National Payments Council of India launched UPI (Unified Payment Interface) system in August 2016 for easy online transactions. Once the user gets UPI enabled app on their smartphone, all they have to do is register their phone number and bank details to start using the app. Yes, there’s going to be a chaos for a few days and managing the logistics and technology for such huge step. 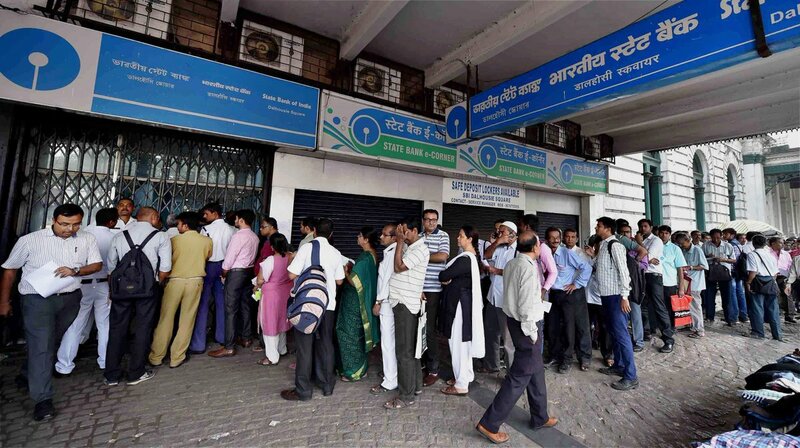 GOI and banks need to manage the mad-rush by the time everyone starts paying through a click! But they’re going to, for sure!